The term Media Facade is often associated with over-dimensional screens and animated, illuminated advertising, and places like Times Square, the Strip in Las Vegas and Hong Kong are trailblazers for this media architecture. The façade itself is dematerialized and turned into one huge advertising medium for sending messages. At the onset of dusk the building moves into the background and serves only as a backdrop for the light show which then becomes the main attraction. 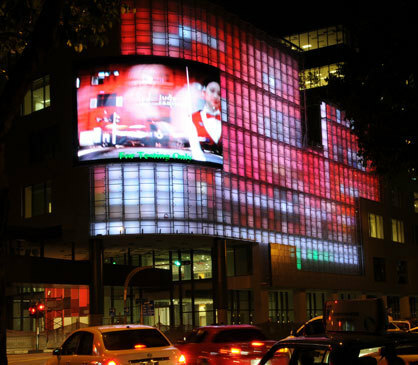 Media facades can evoke the most diverse emotions, from a big city feeling to annoyance at light pollution. They are also seen as tourist attractions, Pop Art or as eye sores. 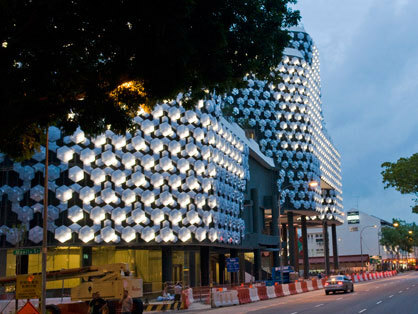 Architecture tends to use media facades more and more as a stylistic feature. What used to be applied to facades after construction more in the way of a blemish is now part of the planning process and offers new scope for visionary design which coined the term 'Mediatecture'. Here we are will introduce the most significant ideas, projects and products. 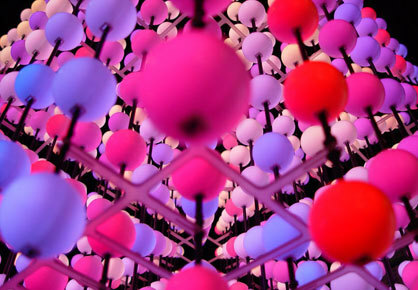 Screens and lighting elements generally offer a change of the three dimensional perception of an immobile object. The first known interactive media surface was, however, made up of a mechanical display and was the result of the work of a team of architects, engineers, mathematicians and programmers. It is precisely this spatial change that creates different surface images which makes the 'Aegis Hyposurface' so revolutionary. The display has been constructed using reflecting metal plates that are moved pneumatically and react in 'real-time' to electronic input. Sensors transfer impulses from the surroundings of the display and these are transmitted to a matrix of rotors to which the metal plates are attached. The movements of the spectators are transferred in 'real-time' to the display and transferred in exact detail into expressive, naturally looking flowing movements. light shining into the building can be regulated. The visible mechanics and the design of the blinds come together in an ornamental pattern that changes in interaction with sunlight. In contrast to mechanical media facades, where surfaces are haptic and tangible, projections form an intangible content beyond the surface onto which pictures are projected. 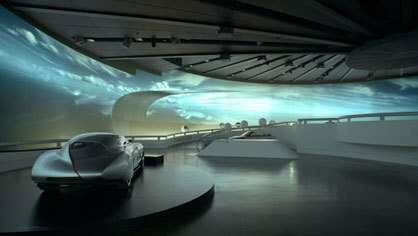 The challenge is the interaction of the surfaces, the technology and the content of the projections. Basically there are two major categories of projections: frontal projection and reverse projection. Frontal projection can be used on a variety of surfaces; ideal of course are projections on to surfaces that are as light coloured as possible while reverse projections are made onto translucent screens that can, for example, be made of glass and acrylic glass. Since media technologies are being developed at a tremendous speed, things that are technical wonders today are mainstream tomorrow. Even in the planning phase, products that we mean to use can become obsolete. The challenge of designing media surfaces lies not only in the technical effect but is aimed at the desired innovative and artistic applications of media elements as part of the architecture and the choice of content. Realities united, the studio for art and architecture, is a forerunner in mediatecture and has gained its first international acclaim with a media facade for the Museum of Modern Art in Graz. Here media content and technology are artistically integrated. Highly ambitious specifications for a semi-transparent skin were meant to transport processes from the interior of the building conflicted with the requirements for usability and the budget. The specifications for an exhibition area asked for a double-shell construction with few apertures which made the transparency of the glass skin obsolete since it was only placed in front of the inner shell. The then still new LED technology was very expensive at the time so that the budget would have been used up after a few centimeters of quartz. The installation that realities united installed, however, has given the outer shell more significance. 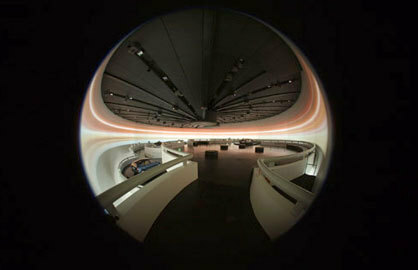 Ordinary ring-shaped fluorescent tubes in the space between behind the façade resulted in 930 gigantic pixels. Once Tim and Jan Edler, the founders of realities united realized that the somewhat antiquated fluorescent tubes could be easily controlled, the skin of the building became a screen. The original goal was achieved and artists have been designing new light programmes ever since. The building now conveys art through abstract images. This is how Tim Edler describes the attraction of fluorescent tubes : Modern LED facades are quickly technically obsolete, but fluorescent tubes appeal to the nostalgic feeling. 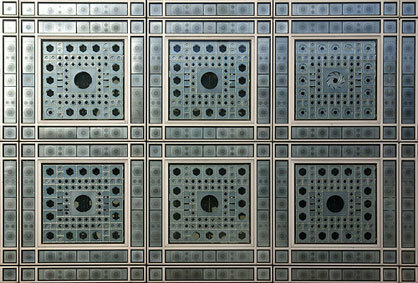 Artists are commissioned to programme the facade using abstract content with low definition for the 'screen'. 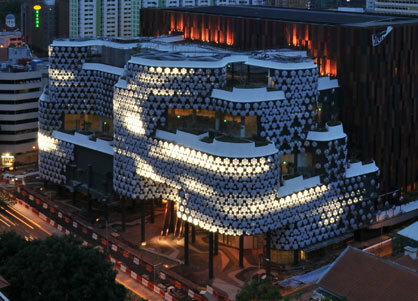 The façade of the Iluma Shopping Center in Singapore demonstrates that an image or a text message require a systematic matrix while the pixel elements can have any geometric form. This insight allows for many design options. For the Iluma façade crystal shaped plastic tubes were developed that are arranged like a mosaic. Behind the structure there is a constant net of LED lights. A combination of several architectural trends make for the attractive aesthetics of the Iluma building. A return to ornament, the Retro glamour of Las Vegas in the 70s and a computer guided illumination with LED technology turn the Alumna building into a sparkling crystal. Special software analyses the moving images of advertising spots on the LED screen and generate a colour reflection with reverse projection technique onto the curtains. 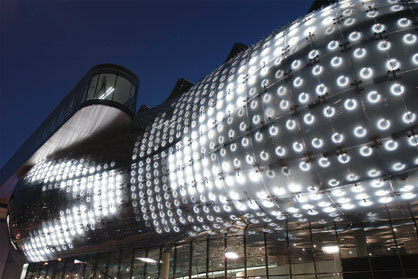 This results in a smooth transfer from LED screen to façade 'screen'. 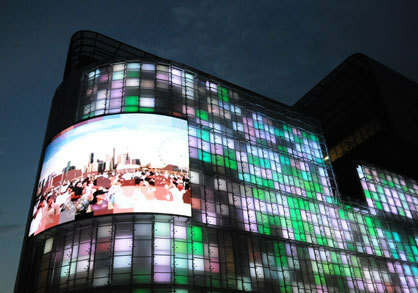 Even though the resolution of the installation on the façade is low compared to that of the LED screen both are seen together as a complete installation, with the brain seeing the coloured areas as part of the advertising film. 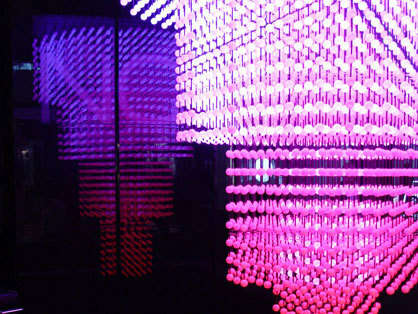 The trend for LED facades for purely architectural purposes, as part of a building shell, has produced a number of new products. Illumesh® & Mediamesh® offer efficient ways to upgrade facades optically. 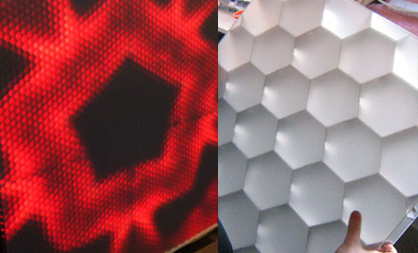 Basically both are made up of a metal mesh that is combined with LEDs. Wherever a lower resolution is sufficient for writing, signs or coloured areas, Illumesh® is the system of choice. For the medial design of images and videos Mediamesh® should be used. 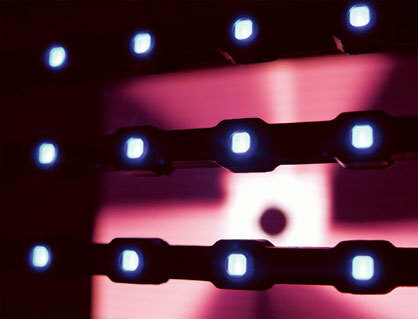 Illumesh uses LEDs in a way that there is reflection from the mesh. 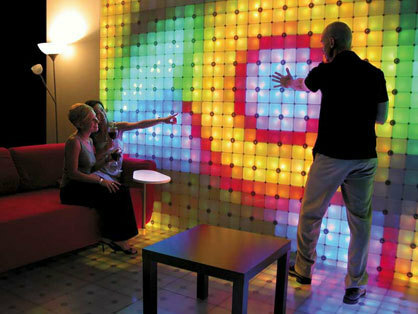 The particular weave of Illumesh creates a shimmering effect on the surface. 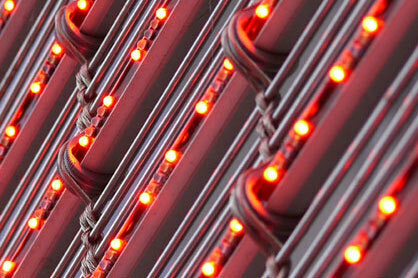 Mediamesh® uses LEDs that are closer together and that radiate outwards. The semi transparency of both metal weaves gives the façade a shimmering dress during the day, at night this retreats to make room to the light show. 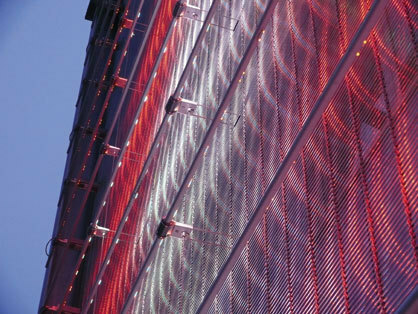 The LED metal mesh comes in strips of any required length and up to 8 meters wide. - Stealth™ has been developed for indoor and outdoor use but is mainly suitable for temporary installations. With a low weight of only one kg per module (0,6 sqm) and a transparency of over 55 % Stealth™ has an impressive image quality, resolution, flexibility, form and luminance. Its resolution is 25 mm, the individual LEDs have therefore a distance of 2,5 cm. Depending on the size of the installation, moving pictures of high quality and high brightness can be achieved. 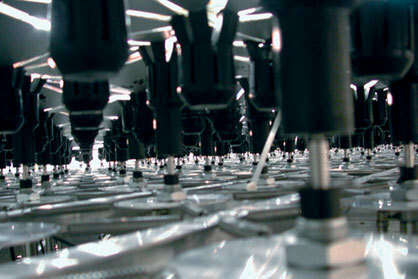 The individual modules are panels that are easy to connect and have integrated electronics and video processing. -Nova® lives up to the promise of its name seeing that the three dimensional imaging of contents has been until now a sensational novelty. In co-operation with ETH Zurich (Swiss federal Institute of Technology) special software has been developed that supplies the so-called voxels (volumetric pixels) with video and graphic image sequences. 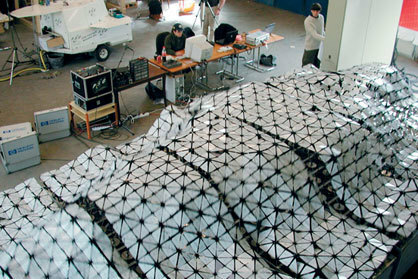 SmartSlab is the name of the company and of a product that was introduced at the Architectural Biennale 2006 in Venice. 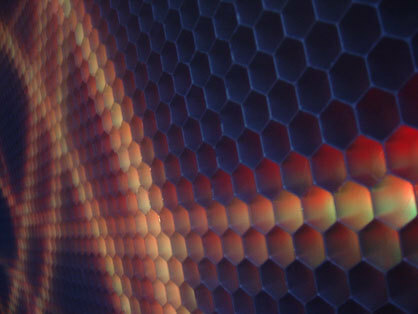 SmartSlab uses two bionic principles – the honeycomb shape and the compound eye. The stability of honeycomb is a protection for the electronics and makes the system robust; polycarbonate offers transparency and high mechanical stability – all this makes SmartSlab ideally suited for external use. The compound eye principle gives a better and clearer picture imaging than other systems. 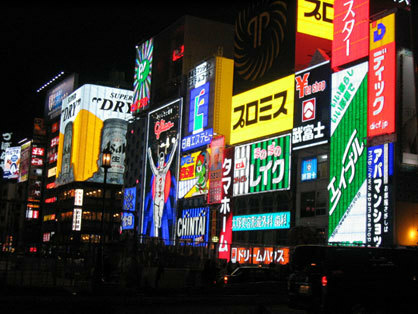 LEDs are certainly going to be a standard with light planning and advertising. This is going to have an effect on our architecture and cityscape. The challenge for architects, however, today and tomorrow will quite simply be to bring art and commerce under one roof.